Hello, my name is Vic Parnell and I am a Face of AS. Cookie asked me to contribute to her website way back in 2013 I think it was. I told her I would if I could have Face number 2000. I said 2000 for a few reasons. One of them being I’ll admit, was that seeing that she had managed to find ONLY around 1000 people to contribute their face, I would be buying myself some time until I had to share my story. It seems silly now to withhold it as I’m just another nobody in the masses, nobody special but as it turns out my ulterior motive would come into play. That motive being…the more people that spoke out, the more the AS community would be listened to. Shortly after saying “yes” I would contribute, Cookie became bound and determined that Mick Mars of Mötley Crüe would become the final face. Now there is somebody famous who happens to have AS and that would go along way to insure that ankylosing spondylitis is known far and wide. Here’s to hoping that Cookie gets her wish for Face 2700. The response you’ll get most often is, “what the heck is ankle… what did you say it was called again?” Now ask that person what they know about arthritis, and you’ll at least get some reasonable kind of response about the aches and pains that their grandmother has. Then they’ll tell you that they aren’t looking forward to getting old, as most people wind up getting stiff and sore in their senior years. While the answer he or she has given does contain a tiny bit of truth, it is surprising how little those who aren’t afflicted with some form of arthritis really know about it. That is why we need to make people aware of this form of arthritis called ankylosing spondylitis. We need to explain that arthritis affects younger people as well. Some doctors today still maintain that ankylosing spondylitis only affects men. Even a quick look at this website shows this simply isn’t true. Doctors know little about what causes it, and that has to change in order to hope for a medical cure to one day be found. All they can do now is offer up medications to help ease the pain that this disease causes and hope that disability is kept to a minimum through stretches and exercise. While some may go on to lead fairly satisfactory lives, depending on how quickly they receive a diagnosis and if they respond to available treatment. The reality now is that most spend years in unexplained pain before proper treatment becomes available to them. Then they still have to hope that once they start treatment, this disease somehow goes into remission before doing too much damage to their bodies. While my situation is not as bad as some, I will share it none the less, with the hope that speaking out will lend a hand in bringing awareness to what ankylosing spondylitis does to those it touches. My symptoms started around when I was 25 years old. It presented itself in the form of a sore left hip. At that point in my life I was working at a very physical job building roof trusses in a factory. I put the pain down to all of the jumping up and down off of a press table that I did in the assembly process. I lived not far from my job so I used to walk to and from work, but this would frequently become very painful to do. After I got there, the pain would slowly decrease and after 1/2 hour of work I would lossen up a bit. The pains would come and go and I didn’t didn’t really give them that much thought to tell you the truth. I’d tell myself that I must be working too hard. Life went on this way for a couple of years, then it started to affect me at night during sleep. I’d toss and turn trying to find a comfortable sleeping position. Sometimes I’d wake up in agony and find that when I tried to get out of bed, I could not put any pressure on my left hip without a searing pain as a morning welcome. This is when I began what turned out to be an eighteen year search for the cause of all this pain. The doctors I saw called it osteoarthritis and prescribed anti-inflammatory medications once they found out that over the counter Tylenol or ibuprofen weren’t relieving the pain. I went through three or four different ones until finally the pain seemed to go away, or so I thought. Fast forward a couple more years. I’d moved back to the city I was born in but still working at building roof truss. I really enjoyed doing the job as it was really fast paced and I worked with some really good people. I spent the better part of three years relatively pain free until increasingly, things that once were easy to do started getting harder and harder. I kept at it until I just couldn’t stand the pain anymore then I quit my job. Still, having to pay the bills, I needed to find some form of work so I applied to be a caretaker at the cities school board. I thought it would be a light enough job that I could maybe do until retirement. Boy was I wrong. I spent three years sweeping floors and cleaning chalk boards but the pain just kept getting worse and worse. I was driving by this time and the drive home at the end of a shift was becoming agony. It was at that point that I happened to find a doctor who had knowledge of the cause of all of my symptoms and he sent me off to see a rheumatologist, who made the diagnosis of ankylosing spondylitis. I continued working until it was just too much to handle. To make a long story shorter, I ended up on ‘long term disability’ and that is the point in my life that I am at now. I should add that I wasn’t started on the newer biological medications until I was put on disability, and they have been what has helped me the most. Not enough that I am able to find employment, as I still have high levels of inflammation that just won’t seem to let up. Chronic fatigue is also a huge problem. Never feeling rested after sleep wears on a persons sense of well-being and confidence in ourselves after a while. Not to mention that the years of having this disease tend to bring on other complications. I hope that our voices are loud and strong enough to push awareness of this disease forward and that strides can be made in early diagnosis and perhaps one day a cure found. Thank you so much for sharing your story with us. After 5 years of being in the draft section of this site, the day has finally arrived. It only took 6 years, 4 months and 20 days I finally get here, but we did it! Welcome to Faces Vic, thank you for sharing your story. Best to you. Thank you for sharing your story! It means a lot to us in the AS community. Know that you are not alone and thanks again for letting your voice be heard. Thanks so much for sharing your story. Best wishes to you. Welcome! Sounds like Cookie’s determination wins and so we all win! Thank you for sharing. 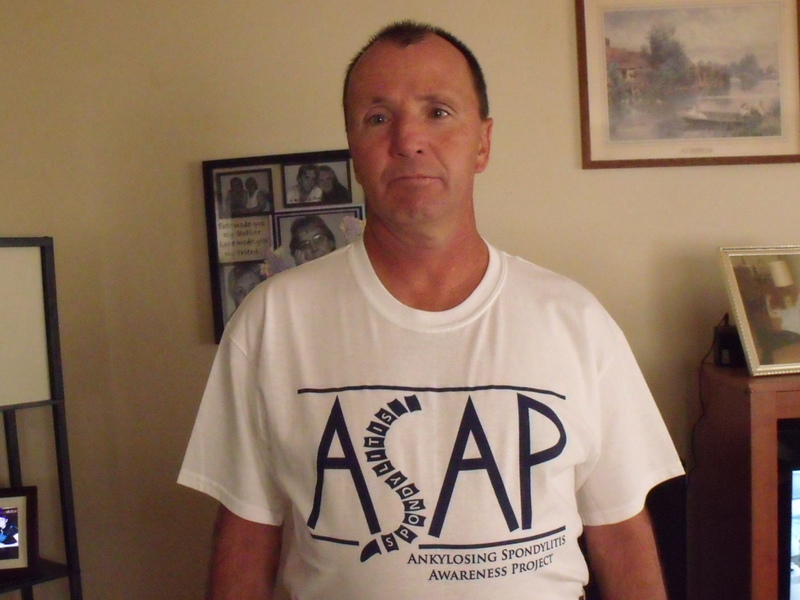 Thank you for sharing your story Vic, every single story of someone who lives with AS helps shed a little more light on what ankylosing spondylitis does and helps each one of us know that we don’t face this alone. Stay strong, and keep active. Thank you all for the warm welcome. While I hate having this disease, knowing that I’m not alone helps me stay focused on living with this disease. Thank you all for the warm welcome. While I hate having this disease, it helps me to know that I’m not alone, making it easier to live with this disease.